Professional trade workers of various applications understand the need to include a band saw in their workshop. It does not just make a task faster being a power tool, but it also performs unique tasks that cannot be done by usual tools. A band saw is designed for metalworking, wood working, as well as lumbering. With the several options that are currently available on the market these days, we saw the need to create this guide to help you make a wise purchasing decision. A band saw is a power tool that is designed with a sharp, long blade which consists of a continuous band made of toothed metal that is stretched in between wheels in order to cut material. It is typically used in task applications involved in metalworking, woodworking as well as lumbering. As a woodworker, I initially thought that having a basic saw was enough. Had I realized the benefits offered by band saws early on, I could have explored on other capabilities as well. Among the several advantages offered by using a band saw includes a uniform cutting action which comes as a result of the even distribution of its tooth load, as well as the capacity to cut curved and irregular shapes. With a 3.5 amp motor capacity, the WEN 3962 offers the best cutting capabilities out there. As such, it is expected to cut even through hardwoods. Since it also operates using a dual-speed, you can choose depending on the type of application that you need to accomplish. Among the features that stand out with this model is the addition of a miter gauge, rip fence, as well as a flexible work light that can guide you through the tasks. With all of these features combined, this model is available at an affordable price. 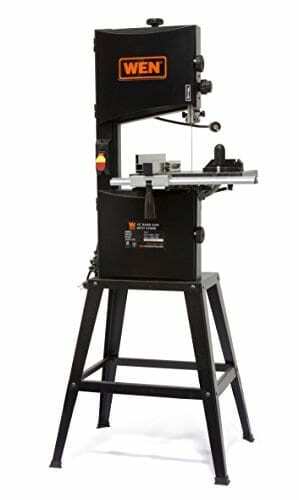 The SKIL 3386-01 band saw is categorized as a budget option. While it may not be considered as the most heavy duty option, the features that are built-in with it make all of the difference. As such, this is a good option for beginners or novice woodworkers who need a tool to be added to their arsenal. It has a motor capacity of 2.5 amp, providing enough power to deal with any type of wood. It only has one speed for cutting, which is not a bad thing. One of its standout features is the use of an articulated work light, allowing you to see what you are doing regardless of the area where you are cutting. POWERTEC BS900 is another affordable option on band saws in the market. This is the ideal choice for those who are dealing with lighter and thinner materials. It is also recommended for those who are not really focused on needing excessive power, or cutting through big wood chunks when doing bigger projects. A band saw is a power tool that should be taken seriously into consideration by individuals involved in metalworking, woodworking as well as lumbering. This means that they apply to professional workers primarily. However, it does not mean that occasional DIYers cannot have this tool as well. In fact, it is also designed to cut on different types of materials. Similar to other tools used in cutting, a band saw is not only restricted to cutting a particular material. As a matter of fact, there are a lot of models available which may be used in cutting various materials including wood and timber, along several others. When compared to other types of saws, such as a chain saw, a band saw offers better results in cutting. One of the primary reason behind this is the type of blade used. Band saws, in general, regardless of the model, use high quality blades that typically come with dual bearing blade guide, blade tracking adjustment as well as several other more advanced features, thus resulting in a precise finish. By far, this is one of the most important benefits that is offered by a band saw. Since band saws typically come with a thinner and smaller kerf compared to other cutting tools, it results in a reduced wastage. Tools that come with wider blades are prone to creating wastage, but band saws offer the use of narrow blades. A band saw, unlike a standard saw, comes with several extra features that will leave you feeling amazed, especially if you are a professional in this field. Among those features include a miter gauge, rip fence, and several others, allowing you to create those straight cuts. As a general rule of thumb, any model of saw that offers less than 1 HP or 750 watts of motor capacity, is expected to struggle with hard wood materials. There are certain models which come equipped with a pulley series which enables you to allow for different rations. This, in turn, increases the power of the saw, though it may also compromise the cutting speed. The cutting height refers to the distance in between the saw table, going up to the top guide, the moment that it is completely extended. This, in turn, determines the overall size of the blank that needs to be cut. For a woodturner, the recommended minimum is 6 inches. However, with models that come with less than 1 HP motor capacity, cutting thicker blanks may prove to be difficult. As a recommended option, 3TPI for your band saw is ideal for woodturners. This also means that it has the capacity to deal with green wood, while carrying away waste and sawdust without the needed to worry about excessive clogging. The rollers and the guides are very important parts of the saw. Most of the more expensive options are typically fitted using ball bearings to adjust these features accordingly. However, you can look for firm blade guides so that you can expect that the entire unit will behave appropriately, ensuring that there is no end play at various directions. 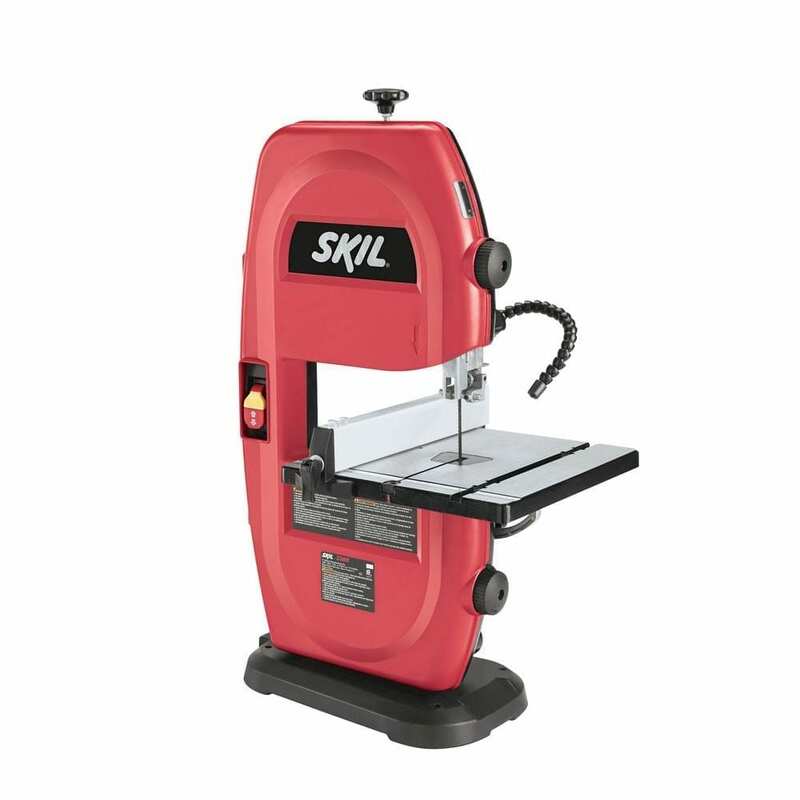 The SKIL 3386-01 model is a 9-inch band saw, which operates using 2.5 amp motor capacity. Whether you are looking for a tool that can satisfy the needs of your profession, or simply to help you with your hobbies, this is a good option to take into consideration. This saw is described as flexible and advanced, filled with features which will make your task, not just comfortable, but most importantly, accurate. It features all details which can work towards increasing your performance on your jobs. With its light weight, you have at hand a good option for an ideal compact band saw that will address your needs. This model uses a standard 2.5 amp motor. This capacity is powerful enough, which means that it has the capability to easily cut through various types of metal and wood without unnecessarily losing its power. This versatility also makes this band saw easy to use. It is worthy to note that not all band saw models come with a rip fence. However, the SKIL 3386-01 model has one, which makes it a good option to consider. If you are the type of worker who like practicality, you will find this feature very useful, since you can easily put the fence away if you need to, using it only when necessary. The use of LED Light in this model is a favorite among many workers in the trade. This is particularly helpful, especially if you are working in an area where the light is not at its brightest. It is a very practical and useful feature because it can speed up your tasks. This model uses durable blades which can last longer, making it wear less even after a continuous use. The blade dimensions are readily accessible, giving you the freedom to choose the best one that can fit the case. This model comes with easy to follow manual guide, as well as adjustable levers which make it very easy to clean up. The replacement for accessories is another feature that makes it really simple. This model is a budget bandsaw. With the motor running at 2.5 amp, it offers enough power to deal with different types of materials. It features an articulated work light, allowing you to see what you are doing. Less power compared to more advanced models. WEN 3962 is a 2-speed band saw which can provide you with some of the best cutting tasks that you can ever find. 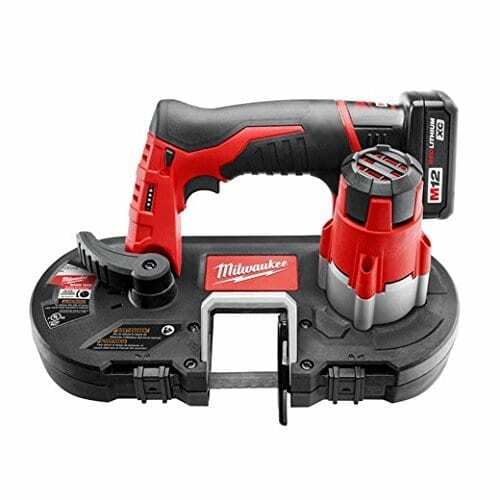 It is backed up with a 3.5 amp motor capacity, making sure that it can cut through different types of materials easily, including hardwoods. With its dual speed feature, slicing through materials becomes easy at 1520 or 2620 FPM. This model has the capacity to cut through materials in two speeds, 1520 or 2620 feet per minute (FPM). It highly depends on the application that you need it to complete. The blade comes with a 10 inch size. However, in contrast with what is offered by other models, this band saw is equipped with a 9-3/4 throat which allows you to use the other parts of the blade. Aside from the main features, it also offers several accessories. One of them is the use of a flexible work light that enables you to lighten and illuminate your tasks. Another accessory is a 3-in-1 dust port which can be used in making sure that the blade stays clear of dust and debris once it is hooked up in a vacuum. This model also comes with a fence, as well as a miter gauge as additional features. At 3.5 amp, the motor capacity is enough to handle tough tasks. It is a dual speed tool which allows to choose the best one required for your task. It comes equipped with a work light that can guide you through the process. POWERTEC BS900 comes with a 9-inch blade size that operates quite differently with that of other models. It comes with a thin blade, operating in an incessant ring, consistently cutting, thanks to its evenly spaced and dimensioned teeth. The motor used in this model comes with a ½ HP induction range, with the device accommodating up to 2.5 amps power, which is enough power to complete different types of tasks. This model is equipped with a detailed patented blade protector which means that it provides assurance in having easy and swift blade replacements. It even has a tracking window that can be used on the blade. The table used for this model comes with a pinion amendment and rack which makes it easier for the user to tilt the model up to 45 degrees. This is ideal when it comes to performing different types of cutting operations. Another patented feature used in this model is the quick blade tension lever, making it easy to replace the blades. Also, since the blade’s with range is versatile, resawing or perfoming scroll cutting becomes easier as well. This model comes with unique and patented features which makes it easier to replace the blades. It can be tilted up to a 45 degree angle. It is also equipped with a patented blade protector. This unit is not ideal for working with bigger pieces. It does not come with a rip fence. DEWALT is one of the leading manufacturers in this industry. The DCS371B model is another proof that the company is aiming for innovation. It is portable, operating with the use of batteries, which means that it offers extra portability and convenience when used. It is also presented with a rugged design, with features that easily qualify it as one of the best options out there. This model makes one handed operation possible, thanks to its small and light design. This is basically one of the reasons why it is preferred by plumbers and electricians, because it allows for cutting tight places and corners, as well as overhead. With its battery operation, you no longer have to deal with tangled cables and wires. Aside from its compact and lightweight design, this model is also equipped with an ergonomic soft grip for a back handle, allowing any user to easily handle it with comfort. This only means that experiencing fatigue and stress is not an immediate issue with this unit. With the support system designed for the blades, you can make adjustments easily on the blade tracking. With the capacity to adjust the tracking, the life of the blade is extended, saving you a lot of money which is typically spent on frequent replacements. Also, its blade guide (dual-bearing) rollers ensures that the support is solid enough. Changing blades with this model is very easy. The use of LED lights make the cutting tasks easier and well-illuminated. It is also equipped with features that make precision in cutting possible. May be considered as expensive compared to other models. The batteries and chargers are sold separately. While most of the manufacturers out there offer a 12V line for their band saw, none is as standout as the M12 model from Milwaukee. This capability allows users to cut materials such as black pipes, conduits, rebar, and several others. With a weight of 6.75 pounds, this is one of the lightest options available. It is also recommended for one handed operations, particularly when creating overhead cuts. Since it has a length of 12 inches, it can get into small and tight spots. This means that this saw is very easy to control. This tool has been designed to meet the OSHA guidelines. As such, it came with a fully integrated lower guard which covers the blade from the outer part of the cutting line. This feature and design makes this model the only one in the market that has met the guidelines. This band saw is also designed to deal cut through ¾ inch EMT in 3 seconds. With this rate, this model has the capacity to perform about 150 cuts on a single battery (M12 Red Lithium XC). With its 1-5/8 inch x 1-5.8 inch cutting capacity, as well as low vibration, this is ideal for cutting through common metal cutting tasks. It also implements the use of a variable speed trigger, which uses an integrated LED light that can illuminate the cutting line while in use. This blade has been especially made for this type of saw, which means that you are not able to use other alternative options from other manufacturers. This model is designed to make accurate and quick cuts. This is the only saw that comes with a fully integrated lower guard. Changing the blade is very easy. Only uses a special blade for this saw. For example, one customer said that this model is “amazingly good”. This is because of its two-speed feature, as well as the use of a work light that serves as guide while cutting. The ratio involving cost to performance is also good with this model. Another customer said that this is a “great band saw for the price”. For its price, it cannot easily be beaten. Setup and assembly of this band saw is quite easy, though you need to have at least background information about what you need to do. Some of the complaints and dissatisfaction received about this model includes the fact that it while it is not really bad, it does not tension enough to ensure that the blade can bind on bigger pieces. Another customer said that this model lacks power. These are but minor complaints compared to the satisfaction reported by other models. The Grizzly G0555LX band saw comes with a 14 inch blade size. It is also equipped with an all-ball bearing for its construction. Both the upper and the lower ball bearing blade thrusts and guides the bearing when performing the cutting tasks. One standout feature of this model is the use of cast iron wheels that are computer balanced, alongside rubber tires. When it comes to the design of the fence, it uses a sturdy and extruded aluminum re-saw fence that is T-shaped and adjustable. 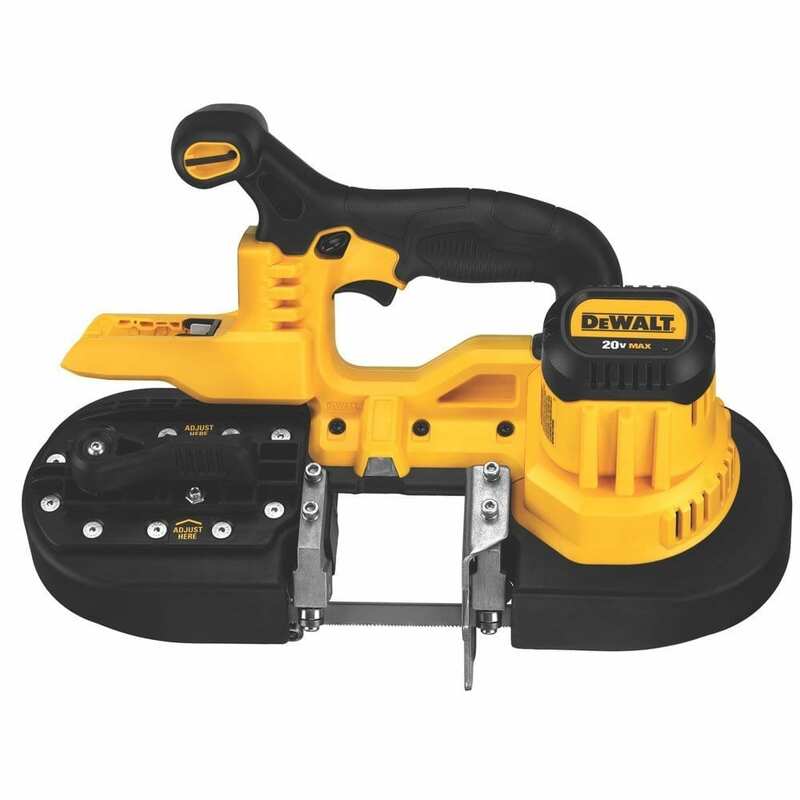 The DCS370B model from DEWALT is a cordless band saw that is designed with portability in mind. It offers control through its 6-setting variable speed dial which allows you to match the needed speed depending on the application. It is also equipped with features that ensures its durability. For example, it comes with a protective bumper design which ensures extra durability and protection. With a weight of 14.3 pounds only, it is comfortable to use, making sure that there is a reduced fatigue on the part of the user. The Makita XBP02Z band saw comes with a compact design, thus ensuring portability during use. 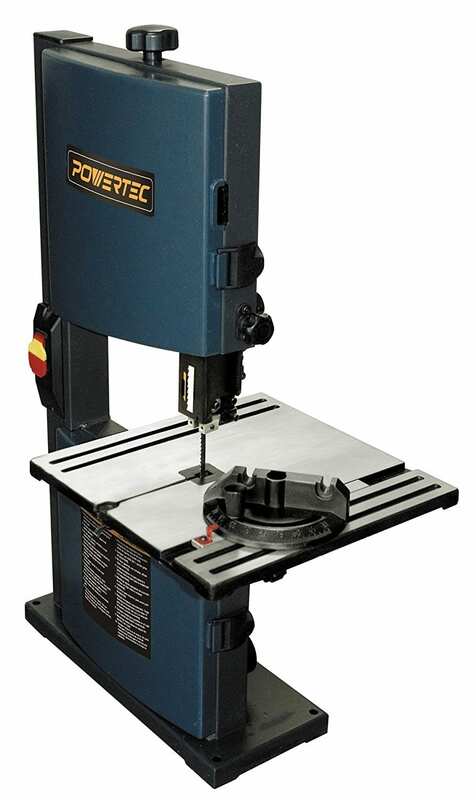 Because of its 2-1/2 inch cutting capability, this model is well recommended for cutting materials including copper pie, conduit, angle iron, threaded rod and channel. It also comes with a blade wheel cover which works in covering the blade out of the cutting area, making it ideal for one-handed applications. For extra durability, it is also equipped with a protective bumper design. Milwaukee 2429-21XC is a compact band saw model which is ideal for different one handed cutting operations. Despite its size and light weight, it has a very powerful motor, which can cut through ¾ inches EMT in just three seconds. One feature of this model is the use of LED light, which means that you can expect a guide that will highlight the cutting line. You also have better control over this model, thanks to its adjustable blade tracking, as well as blade tension adjustment. The Milwaukee 2629-20 M18 band saw is a cordless model which is very compact in terms of design. As a matter of fact, this feature makes it ideal for working in tight places as well as cutting overhead. With its 3-1/4 inch cutting capacity, it can cut through most of the common types of materials for various professional users, including plumbers, electricians, as well as for mechanical applications. Other features of this band saw includes a blade ejection system, as well as an adjustable material guide which makes it easier for you to cuts that flush to walls or ceilings. The JET JWBS-14DXPRO band saw kit comes with some features that make it a good option to take into consideration. For instance, it comes with a built-in 12 inches re-saw capacity which is ideal for cutting through bigger wood pieces. It even has a new design for its upper and lower cast iron frame, thus ensuring an increased rigidity and strength. It also makes the task easier with its blade tracking window that is easy to view. Makita XBP01Z band saw is a cordless and compact model which is equipped with a built-in motor that has the capacity to produce up to 630 FPM blade speed. This means fast cutting of various materials, including threaded rod, copper pipe, channel and angle iron. It even comes with a cover for the blade wheel, thus covering the blade out of the cutting area. This feature is what makes this model a recommended and ideal option for those who need to do a one-handed operation. This band saw model from Craftsman offers a continuous duty motor power of 1/3 HP with 3.5 amp capacity. In terms of durability, this model is constructed using a durable cast iron table, which provides 0 degree to 45 degrees bevel cutting. One thing to note about this model, however, is that there is a need to assemble this unit upon purchasing. However, it comes with a guide and a manual which is easy to follow. This MBAND1412-175 band saw model from Laguna Tools is equipped with a number of features that come as a result of recent improvements done to models under this manufacturer. For example, it now comes a pyramid spine for its design, as well as the use of a TEFC motor which is equipped with a quick release tension feature. As a model under the Laguna brand, it also uses pinion and worm gear which is ultra-smooth, especially engineered in order to produce minimum flex even when it is completely extended. It also features double windows which enable you to check both the tracking and tension while the machine continues to run. The Milwaukee 6232-21 band saw model is often described as easy to handle and very easy to use. In order to provide protection to the equipment when not in use, it even comes with a case. It also offers deep cutting capability that can fit various tasks at hand. In terms of design, it is a corded, electric model, which means that you need to take into consideration the presence of electrical outlets when using this band saw model. All in all, choosing the right band saw can be a challenging task, only if you do not know what you are looking for. As you have seen, there are a lot of options available, with different categories to take into consideration. With the guide provided, you can now make a good choice. There is no need to get an overly expensive band saw model just to get the features that you need. It is advised, however, to write down the features that you want to see, and compare them with the options provided above.